On 20th June Councillor Darren Parker was suspended by the Council’s Standards Sub-Committee from participating in any Council Committees and directed to undertake further training in the "Councillors Code of Conduct". The Sub-committee found that, on Councilor Parker’s own admission, he had breached the Councillor’s Code of Conduct. The suspension is immediate and for a period of three months, which is the maximum period which the Sub-Committee could impose, or until he undertakes the training if earlier. The breach concerned Councillor Parkers failure in July 2006 to declare a “personal interest”, namely his employment by the Commission for Architecture and the Built Environment (CABE), before Chairing a Committee and using his casting vote to grant planning permission to the London Development Agency (LDA). The permission was for the demolition of historic buildings, including Dalston Theatre and Georgian houses, and building towerblocks. Council officers had relied upon CABEs favourable comments when recommending that the application be granted. The Standards Sub-Committee stated that it was a difficult decision with finely balanced arguements. It also found that a member of the public, knowing the full facts, would not reasonably regard Cllr Parker’s employment by CABE as so significant that it would have been likely to prejudice his judgment of the public interest and thus have disqualified him from voting. Councillor Parker had denied that the fact of his employment by CABE had influenced his votes in any way. Following the Committee’s verdict his representative said, in his mitigation, that he had been the victim of a “vicious and highly charged campaign” which sought to “challenge the authority of the Council” and which had affected his relationship with his employer. The permission and funding to extend the East London Line to Dalston was already in place and proceeding when TfL proposed rafting over Dalston Junction railway cutting to build a bus station and “transport interchange” on top of it. The dense revenue-generating development of flats for private sale, on both TfL's and Hackney's sites, and the £millions subsidy by Hackney, is driven by the need to fund the estimated £39million costs of the concrete slab. This amounts to over £3million per bus stand. There will be over 75 concrete lorries arriving in Dalston every day for months once construction starts. Yet the authorities claim that the developments, with “eco-homes”, wind turbines and green roofs on the towerblocks, are “environmentally sustainable”. OPEN has estimated, with advice from consultants to The Carbon Trust, that the carbon emissions to construct the reinforced concrete slab alone will produce approximately 15,000 tonnes of CO2. This is equivalent to the GLA's electricity bill for the next 12 years or the GLA’s Mayor Ken Livingstone, or Hackney’s Mayor Jules Pipe, flying return to New York continuously for the next 34 years. This gross waste of financial and natural resources to construct the Dalston slab has been authorised by the GLA's and Hackney’s Mayors. OPEN would regard anything more than a one-way ticket to New York for them as a further extravagance. 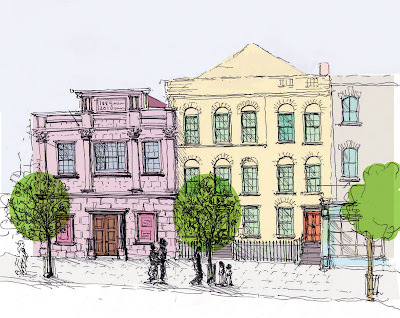 Demolition of Dalston’s historic buildings: Darren “One man, two votes” Parker to face Hackney Standards Committee hearing. An investigation, instigated by the Standards Board for England (SBE), has found that Hackney Councillor, Darren Parker, had a personal and a prejudicial interest when he used his Chair’s casting vote last July to grant planning permission for the demolition of Dalston’s heritage buildings and their replacement with towerblock flats. The investigation has found that Councillor Parker should have withdrawn from and not voted in the meeting. Had he done so the application would have been refused on the balance of votes cast. Hackney’s Standards Sub-Committee is to consider the report’s findings, and Councillor Parker’s representations, and make a ruling on Wednesday 20th June. The London Development Agency’s (LDA) controversial application, to demolish the heritage buildings and replace them with towerblocks, came before Hackney’s Planning Sub-Committee on 13 July 2006. How it was - despite the years of deliberate neglect by Hackney Council, the buildings had survived: the pair of 1820's Georgian houses, the original 1886 circus entrance, the 1898 Theatre Entrance in front of it (aka The Four Aces & Labyrinth Clubs) and the Dalston Theatre behind. The Committee granted permission to the LDA to build 244 towerblock flats of which only 58 (24%) will be affordable housing and which will have children living up to the 20th floor. Profits from the sale of Hackney Council’s site to the developer, Barrat, will be paid to the LDA to subsidise a £39million concrete slab over the neighbouring railway site owned by Transport for London (TfL). TfL’s development will comprise a bus station and more towerblocks of up to 20 storeys but all of the 305 flats proposed there will be for sale with no affordable housing at all. 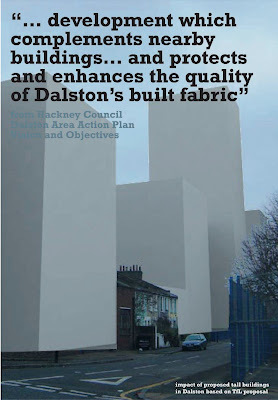 The proposals met with hundreds of objections from the local community and OPEN obtained 3 High Court injunctions to delay the plans whilst arguing for retaining some of Dalston’s character buildings. Since November 2005 Councillor Parker had been an employee of the government quango, the Commission for Architecture and the Built Environment (CABE). He was elected to the Council in May 2006 and by the time of the July decision had been appointed Vice-Chair of the Planning Committee. His employer, CABE, was a consultee on the application and Hackney’s officers had relied on its positive opinion of the redevelopment schemes when recommending that the Planning Committee grant the application. A scheme to retain some of the historic buildings was never considered. Hackney had convened a “call over” meeting a week earlier to “discuss the application” with Councillor Parker. The usual Committee Chair had declared a conflict of interest and could not participate in that discussion and the later Planning Committee meeting. Councillor Parker chaired both meetings without declaring any interest. Councillor Parker, who had recently had conflict of interest training, reportedly did not seek prior legal advice but immediately after the second meeting he informed the Council’s Monitoring Officer of his position within CABE. He has subsequently stated to the investigating lawyer “it is clear now that I definitely had a personal interest” but, whilst accepting that he contravened Hackney’s Code of Conduct, he denied that his interest was prejudicial. The lawyer has however found that it would not be unreasonable to assume that he “would not approach the application with an open mind for various reasons including not contradicting the views and wishes of his employers in order not to jeopardise his employment or the likelihood of progressing in his career within the organisation… he should have withdrawn....and not participated”. Darren Parker has since resigned from the Committee. Councillor Parker had declared his employment on the Council’s Register of Member’s Interests but, despite this, the Council’s Monitoring Officer, the Committee’s Lawyer and the Committee’s Officer all denied advance knowledge of his employment. The Committee Officer stated that had he known he “would have advised him to declare an interest as this case was high profile”. Since then the Register of Interests has been withdrawn from the Council’s web site, although this is reported to be due to genuine technical incompetence rather than because Hackney has something to hide. The LDAs planning application was considered again in September when some amendments were made to the planning conditions. Commenting on this, Hackney’s Head of Regeneration, Fiona Fletcher-Smith stated in OPENs injunction proceedings that “the minor alterations identified in the report to a (September) planning sub-committee in regards to this application are not felt to affect the principles of the decision previously made on 13 July”. However Hackney has since sought to argue that, because Councillor Parker was not present at the September meeting, any defect in the July permission had been remedied. Despite knowing that the SBE investigation was underway in September, Hackney’s Mayor ordered the demolition of Dalston’s historic buildings to proceed in December. Hackney has failed to convene its Standards Committee to consider the allegations until now although the investigation report was completed in March. Its Head of Law, Amanda Kelly, is reported to have denied that there has been any unreasonable delay and has stated that “the planning consent was given for the Dalston Lane development and that consent still stands”. The demolished and cleared site remains empty because Hackney has been unable to complete its agreement with Barratt since receiving independent legal advice that the disposal of its site, in exchange for a peppercorn rent and a four floor shell to house a library, is "for less than the best consideration that can reasonable be obtained". The Council must therefore obtain government approval for the deal. The buildings proposed have been designed to maximise revenue without regard to Dalston's character and streetscape. Viewing TfLs designs, local artists have commented. We have witnessed municipal vandalism, incompetence, dishonesty and a hypocritical betrayal of Dalston’s community. This scheme is costing Hackney's taxpayers millions. They are not building Jerusalem but Croydonising Dalston with buy-to-let slums of the future. Hackney has sold our grandchildren’s heritage buildings for a peppercorn to subsidise a £39million concrete slab with towerblocks which will blight Dalston. Read the posting "The story that was never told"